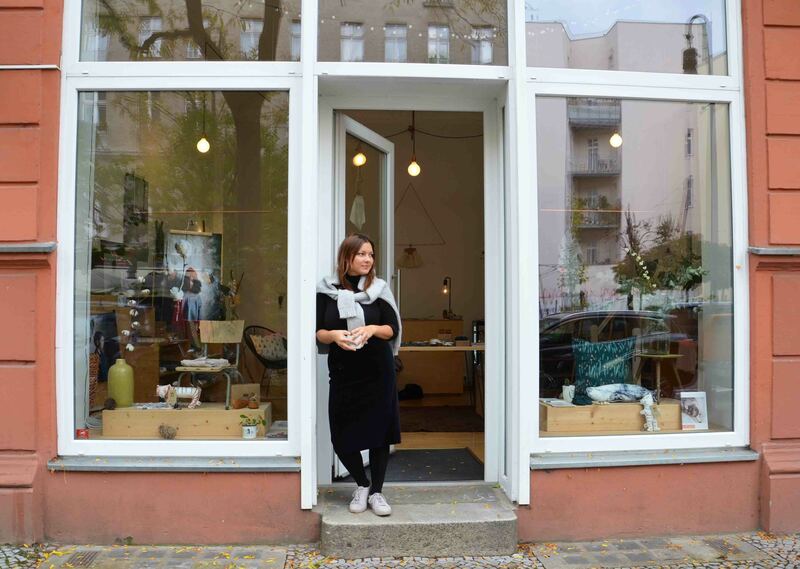 We met Valeria Popov, designer and founder of MONKIND in her pretty label’s store in Berlin-Schöneberg. 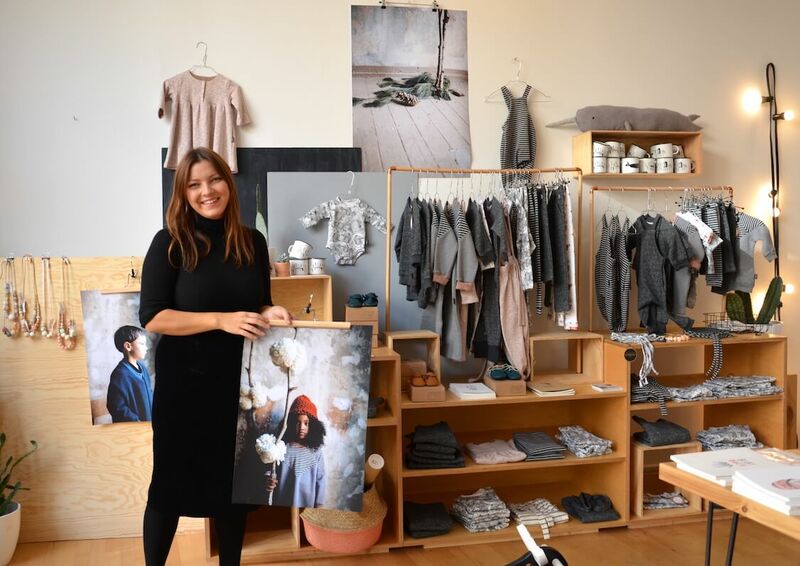 For two years she’s been running the brand together with her husband Stewart, selling and producing stylish kid’s fashion that has become an international success. 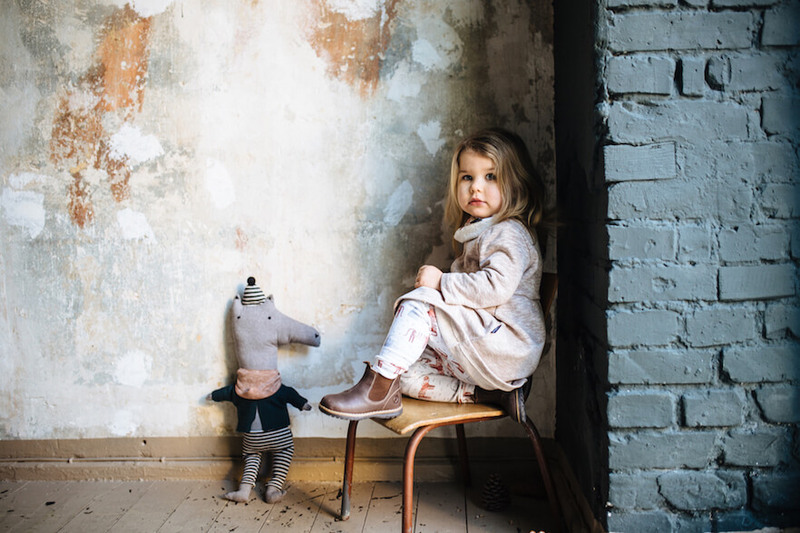 After the couple’s second child they used the parental leave to turn a long-awaited idea into reality: a fresh and young Berlin-based children’s label. MONKIND is laid-back design with a distinct feel for aesthetics. 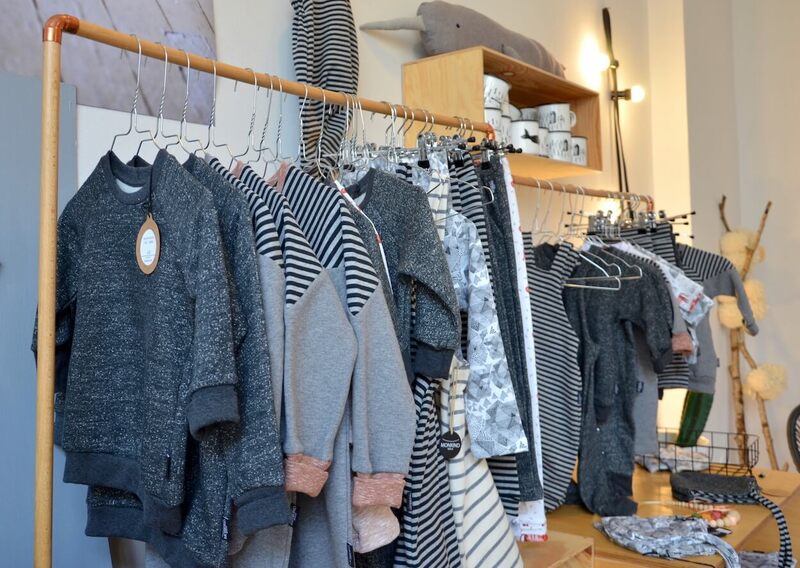 Fashion that parents and kids love equally. 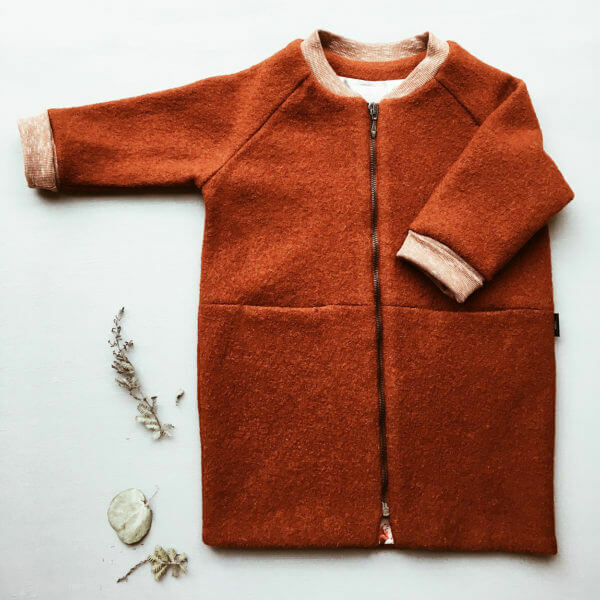 Predominantly GOTS-certified materials are used throughout the production process with the long-term aim to exclusively manufacture all clothes organically one day. Valeria is a bubbly, sparkling and lively woman and simply adorable! The 28 year-old mother of two welcomed me cheerily while proudly (and quite deservedly!) showing me around her shop with all its beautiful garments. Valeria grew up in the former Soviet Union and for 15 years now she’s been a Berliner and enthusiast of this city. Here is where she can truly live out her passion for art and culture. Read in our interview what influence her post-Soviet upbringing had on her creative development and what she finds important when selecting her own clothes. Tell me a bit about yourself: how would you describe yourself in a few sentences? Art, design, theatre, dance and music have long been my greatest passions since childhood and they still influence my work today. I also try to see the little setbacks in life as important learning experiences for the future: essentially it’s the journey, not the destination that counts. I’m convinced that with a lot of dedication and love the result always turns out good. This applies not only to work but also to rearing children and friendships. What did you like wearing as a child? Was there a special piece of clothing that was very close to your heart or that you connect with a story? I vividly remember choosing my own clothes quite early in life. Often I’d wear skirts over pants, which in young post-Soviet Ukraine in the 90s seemed to many quite bizarre. My mother regularly sewed and knitted clothes for me, many of which I’ll remember forever. The strongest memory I have is of a little silk dress she made to my own specifications. It was a twirl-dress that I wore to a school party, subsequently making myself dizzy by spinning all night showing it off. You were born in Odessa and grew up in the former Soviet Union. What did you take from that time, and did it shape your style? In the Soviet Union and after Perestroika there were very few clothes in the shops that looked modern. Therefore all the women in my family would sew their own clothes copied from fashion magazines. This inspired and empowered me immensely, so that from an early age I knew that designing clothes would be my profession. 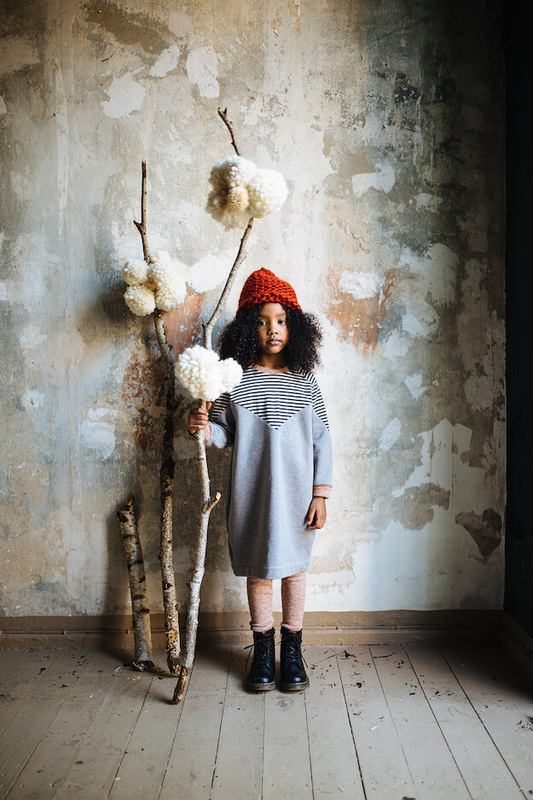 How did you get the idea of ​​designing children’s fashion? When our first child was born I began making clothes for him. Then I noticed that there was not really that much children’s fashion from Berlin. 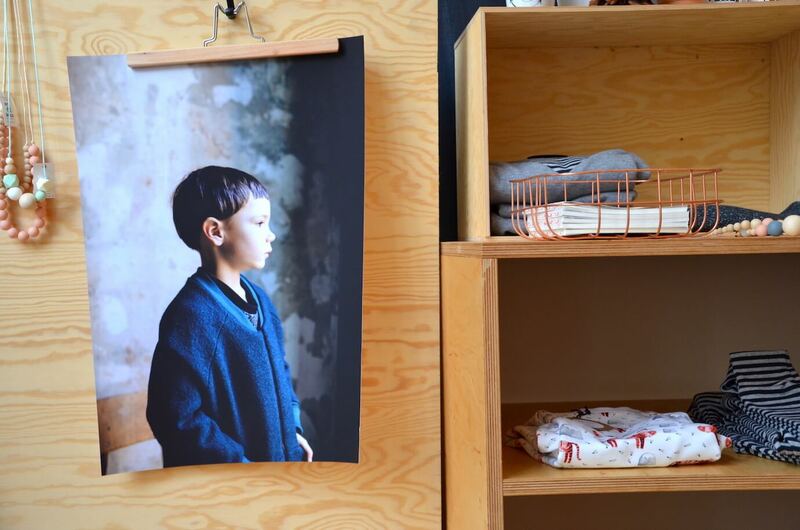 It all started quite modestly and I had no real intention of founding a kid’s wear label. However, after a trial-period I realised that this was going to be just the right thing for me. What does the name MONKIND mean and how did you choose it? We wanted a name with international connotations: it stems from the word “mankind”, which we converted into MONKIND. Our criteria was that it should be easy to pronounce in many languages, concise and succinct. I think we succeeded! How long does MONKIND exist? Since the summer of 2014, though exists in my imagination a good few years before that. The decisive step was during our parental leave with our second child. Right from the beginning we had a shop/atelier as it has always been important for us to have direct contact with our customers. How would you describe the MONKIND style? It’s casual and playful at the same time as being cool and timeless. The colours are subtle and easily combinable. There are basics and our favourites – like the dungarees – that we had from even before the beginning in every collection. Where do the materials come from and where and how are they produced? Almost all our materials are GOTS certified and where possible locally sourced. The majority of organic fabrics in Europe are produced nowadays in Portugal or Turkey. How does a new collection evolve, where do the ideas and inspiration come from? Often, the photoshoot’s location and styling is in my head a long time before even the first piece of clothing has been conceived. Imagining a story, I gather the colours, patterns, fabrics and forms in a sketch-book and on Pinterest. After that we work on the samples. This can take several weeks / months and is the craziest and most exciting process that I love about my work. My greatest daily inspirations are my children and the art they present me with. However, the best ideas come whilst travelling or after switching off from a particularly stressful day. You also work with the illustrator Sarah Neuendorf from Gretas Schwester. She designs some great prints. How did you meet and how do you collaborate? It was mutual love – and respect – for each other’s work at first sight, yes, I know: kitsch-alert! Sarah founded Gretas Schwester around the same time as MONKIND therefore we had a lot to talk about. At first we sold Sarah’s products in our shop/atelier and shortly thereafter we developed the first fabric print designs together. Coincidentally we’re also neighbours and now very good friends. 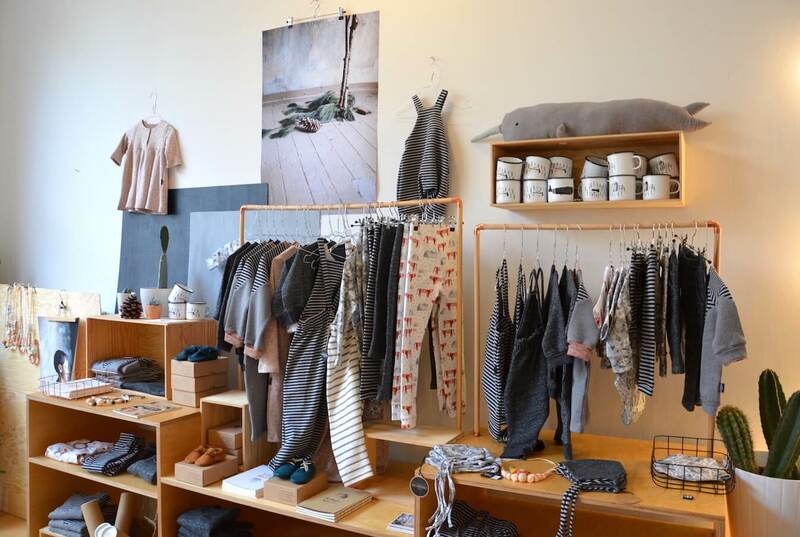 Since January 2016 we share a shop: Monkind x Gretasschwester StudioStore on Crellestraße in Berlin-Schöneberg and work on many projects together. 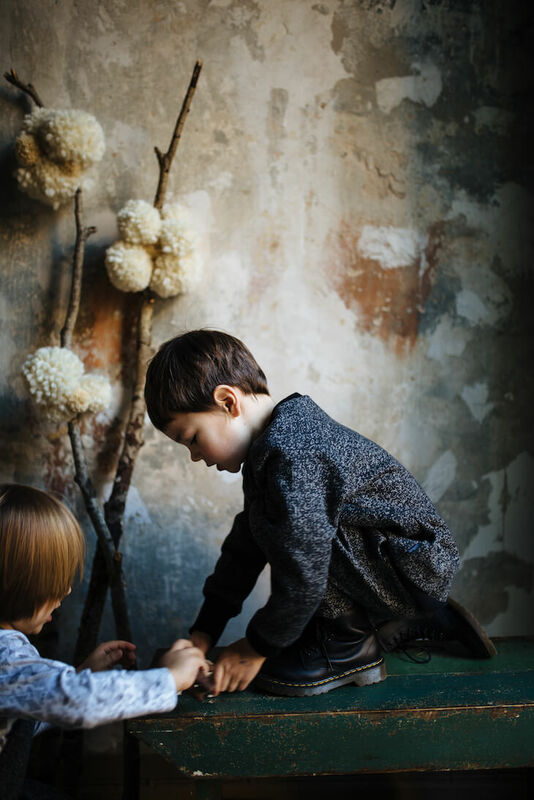 The lookbooks from MONKIND always have something familial and artistic about them. The lookbook for the autumn/ winter collection 2016 has a mystical and antiquarian look and is warm and modern at the same time. What role does art play for you in your life? Thanks! “Family” hits the nail on the head. Our photoshoots are always very familiar and comfortable. Our photoshoot “team” now knows exactly how it works and for the children/models it’s also not the first time. From the very start we’ve been lucky enough to work with the most amazing and brilliant photographer Jules Villbrandt, as well as always having Sarah there as part of the team. When working with these women we often communicate on a different level without words so it’s no surprise that the result is very artistic and a whole load of fun. Since childhood I was surrounded by art and music. My mother is an artist and an art teacher and gave me the gift of love of colour, composition and form. It’s important for me to give my children the same daily freedom and opportunity to become creative. We found you in Mama Styleguide. What’s important for your own fashion? What makes you feel most comfortable and why? I focus on the material and like to wear natural, soft fabrics such as cotton, linen and wool. It’s easier for me to sew clothes myself than to go shopping and those homemade items I love all the more. My wardrobe is made up of darker, natural tones and a lot of black, it soothes me. What is your favourite city and the best that it has to offer? I love Berlin. I think it is a city with an incredible energy. The diverse life-styles and cultures along with the beautiful parks and the general atmosphere in the city excite me, especially in summer. Which children’s fashion do you like, besides your own? There are so many amazing labels I love: The Animal Observatory, Caroline Bosmans, Frankey’s, Rylee & Cru, Tocoto Vintage . They all have very different styles, though are all entirely unique and recognisable, which I think is important in a brand. …they live in the absolute present and the only important thing for them is the now! Dear Valeria, thank you for the beautiful morning in your store together and the insights you gave us into your life and MONKIND. This is our selection of the current collection AW 2016/17. 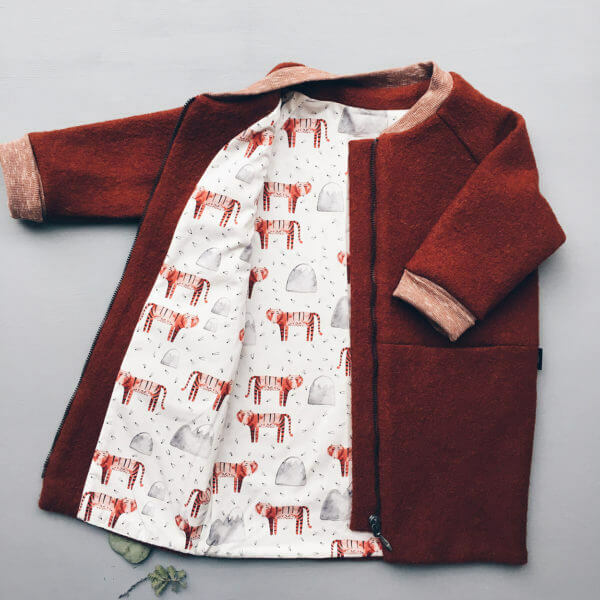 You can get this limited edition stylish coat exclusively from MONKIND (online and in their store). What are you waiting for? From February 2017, the summer collection 2017 will be available online and in their store in Berlin. We managed to get a first glimpse of it, voilà! Watch out! Using the discount code pepeundnika will give you 15% off all MONKIND products in their online store until 13th December 2016. Have fun checking it out! Nadja (35) is a real Berliner, but absolutely no local patriot. She is the second half of Pepe & Nika and lives together with her son Pepe (4) in a 2-room apartment in children-friendly Prenzlauer Berg.